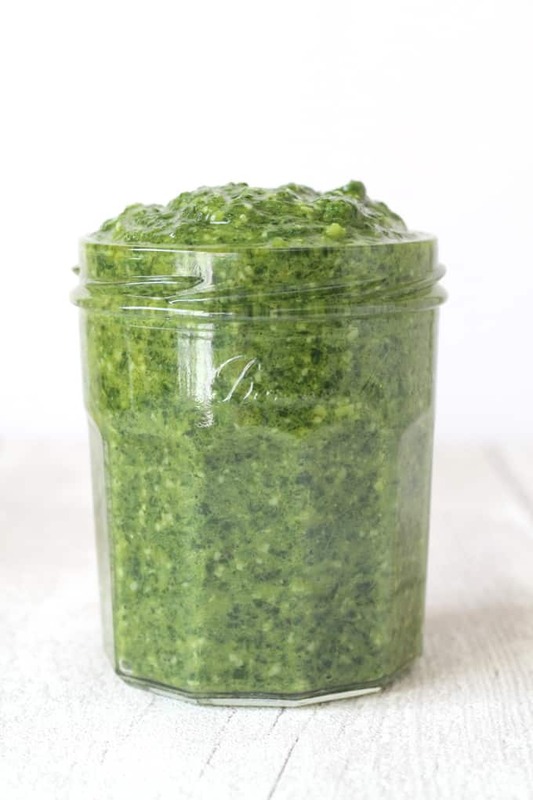 A delicious and nutritious Spinach Pesto ready in just 5 minutes! 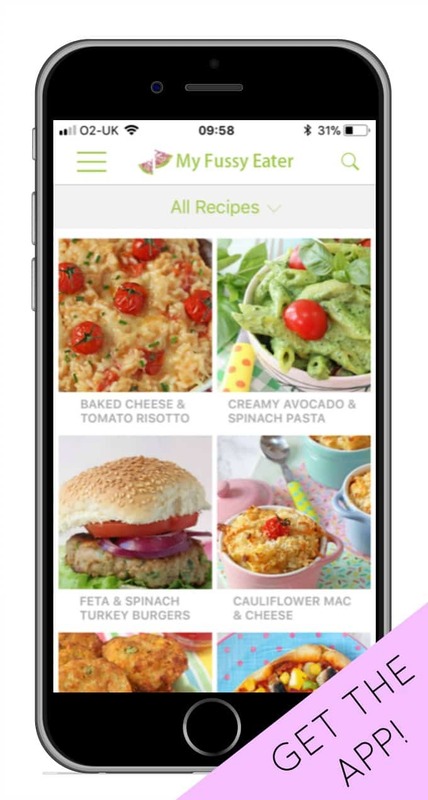 We all have our go-to meals…quick, easy meals that can be thrown together when you’re in a hurry. 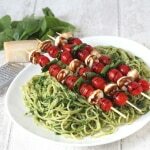 Pesto pasta is definitely one of mine. 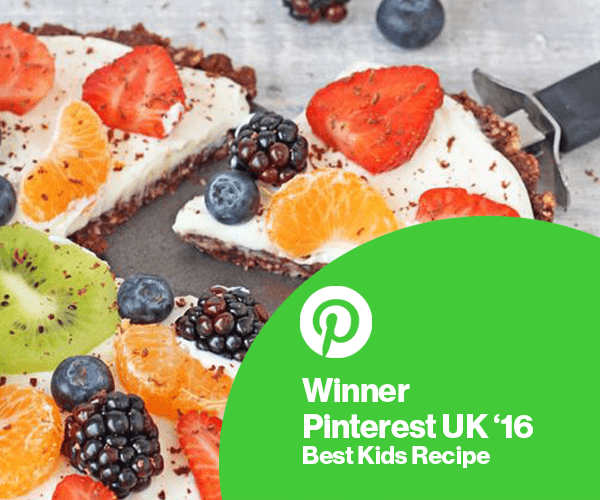 I can whip it up in just a few minutes and I know my fussy eater will eat it and that I can avoid an argument at the dinner table for one evening at least! Spinach is one of those vegetables that I really struggle to get my daughter to eat. No matter how I try to cook it or hide it in dishes, she always manages to pick out those stringy bits of green. So I wasn’t too convinced that I would be able to fool her with this pesto. But how wrong was I! She gobbled down two portion of it with spaghetti and declared it “deeeeelicious”! I am really chuffed to have finally found a way to get her to eat spinach as it’s is up there with the best of the superfoods. Popeye had the right idea downing tins of the stuff! 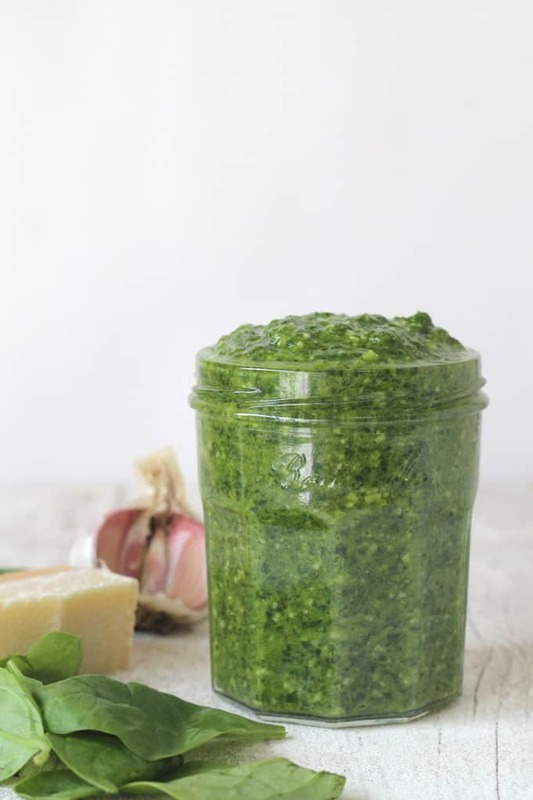 And remember pesto isn’t just for mixing with pasta. Try it as a topping for baked chicken or fish and add a few breadcrumbs for crunch. 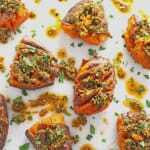 Or try marinating a few cubes of feta in pesto to jazz up a boring salad, or even add some extra oil to make it into a salad dressing. The possibilities are endless! Chuck half the spinach and the rest of the ingredients into a food processor and blitz until smooth. Add the remaining spinach and blitz again. 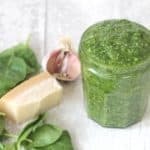 The ingredient quantities are not set in stone so you can change them depending on how much parmesan you like or alter the oil quantity depending on how you like the consistency of your pesto. This goes really well on pasta. Haven’t tried it on anything else yet but really like it! Thank you so much Emma. 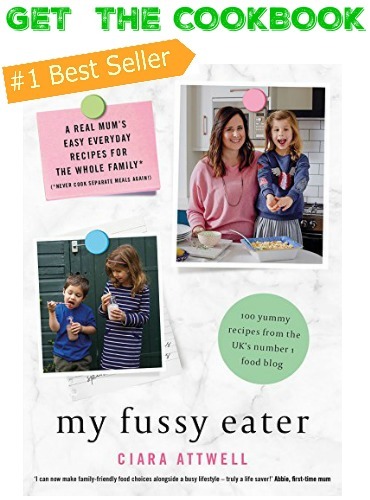 Please come back and let me know how you are getting on with switching your family to clean eating. Yes! It’s now in ALL my pictures!!! Hope you like it Chloe. Its a big hit in our house! 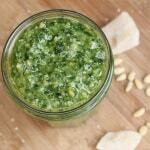 I love making spinach and kale pesto. It is a great way to get some extra vegetables in a meal. Ouuu I haven’t tried kale before. I’ll have to give it a go!